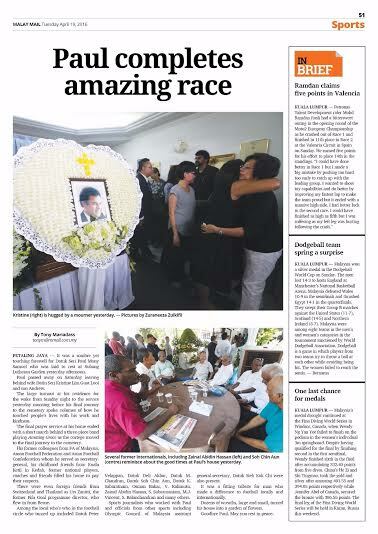 It was a sombre yet touching farewell for fitting for Datuk Seri Paul Mony Samuel who was laid to rest at the Subang Lutheran Garden yesterday afternoon. Paul passed away on Saturday night leaving behind his wife Datin Seri Kristine Lim Guat Looi and son Andrew. He had fought an excellent fight and finished his race. The large turnout at his residence for the wake from Sunday night to the service at yesterday morning before the convoy of cars followed the cortege to the cemetery spoke volumes of how he touched people's lives with his work and kindness. The final prayer service at his home ended with short march behind a three piece band playing Amazing Grace as the cortege moved to the final journey to the cemetery. 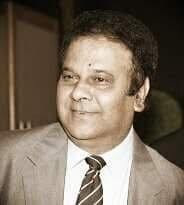 His former colleagues at the FA of Malaysia, Asean Football Federation and Asian Football Confederation whom he had served as general secretary, his childhood friends from where he grew up in Kuala Ketil, former national players, coaches and friends filled his home to pay their last respects. Among the local who’s who in the football circle who flew in from Berne. turned up included Datuk Peter Velappan, Datuk Dell Akbar, Datuk M. Chandran, Datuk Soh Chin Aun, Datuk K. Sabaratnam, Osman Bakar, V. Kalimutu, Zainal Abidin Hassan, S. Subramaniam, M.J. Vincent, S. Balanchandran and many others. It was indeed a fitting tribute for man who made a difference to football both locally and internationally. Dozens of wreaths, large and small, turned his house into a garden of flowers. Goodbye Paul. May you rest in peace.